Prove that justice for the poor is possible. One of the things we love about what we do is that we get to partner alongside some amazing people. Along the way, we learn about and are implicated in some heart-breaking aspects of life on Earth yet get to see the hope that comes out of the solutions our partners are putting together. That’s the story of our work with International Justice Mission (IJM). IJM is on the front lines of the struggle to bring freedom to those in slavery while at the same time working to prevent the violence in the first place. 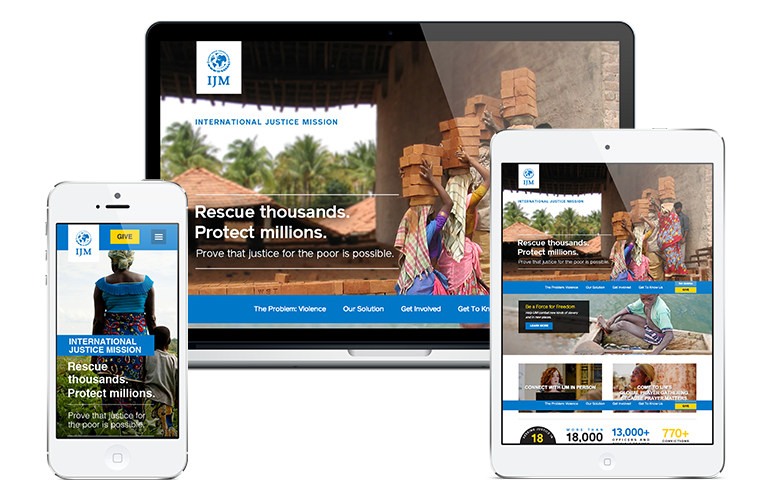 Since 2010, CiV Digital has collaborated with International Justice Mission on a series of digital projects including two editions of its main web presence, a custom mobile site and several campaign-specific initiatives. Analysis & Assessment. End-to-end review of previous web presence to include marketing, workflow, design and technical needs assessment. Strategy & Consultation. In-depth departmental consultations with International Justice Mission to assess priorities and create overall plan for new web presence. Visual Design. New visual design and user experience (UX) to better highlight stories of impact and sync with new branding guidelines. Digital Style Guide. Creating Digital Style Guide to outline typography, image treatments and other key elements of International Justice Mission’s digital presentation. Drupal CMS Upgrade. Comprehensive overhaul of the Drupal CMS simplifying site maintenance and improved workflow. Custom mobile site. Created custom mobile experience for handhelds and tablets. Inbound Marketing/AdWords Grant. Managed and optimized Google AdWords Grant campaigns.